The Panthers got their second battle of the west in as many weeks, taking on the Bulldogs at ANZ after a rousing comeback over the Eels in the first round of the 2018 NRL season. Coming into this match the mountain men were keen to make it three wins in a row after having triumphed over the Bunnies the week before, while the Dogs were just as anxious to avoid making it three losses in a row on the back of dramatic defeats at the hands of the Storm in Round 1 and the Roosters in Round 2. The game started suspsensefully, with two tryscoring opportunities for the Bulldogs receiving intense scrutiny from the Bunker, which replayed each of them ten or fifteen times in order to assess whether they deserved to be rewarded with four points. The first came off the back of a deft crossfield kick from Kieran Foran, which was knocked back by Waqa Blake, and then regathered by Josh Morris, who smashed over the line only to be met by a courageous scrambling effort from the Penrith defence to keep the Steeden off the ground until the tackle was complete. The second occurred on the next tackle, and was more contentious, with Moses Mbye crashing over in the opposite corner. The refs sent it upstairs due to the possibility of obstruction, and sure enough the replay showed that Will Hopoate had taken James Maloney out of the play – not as completely or as emphatically as he might have, but still enough to put him at a disadvantage in getting to the ball. If the ex-Shark had taken a dive then it might have been enough to disquality the try, but as it was the Bunker deemed it minimal contact and awarded the Dogs the first four. While there was a certain poetic justice in seeing Mbye score the first points of the game – he’s easily been one of the best players for the Dogs this season, and possibly the best – and while this might have felt like a vindication of Dean Pay’s decision to cement Mbye at fullback, there was still a lingering sense of anticlimax to the try, and the inconsistency around some of the obstruction rulings in recent weeks. With Mbye’s conversion hooking away to the left, it felt as if the Dogs hadn’t quite earned their lead, and needed to fight for it even more over the coming sets. 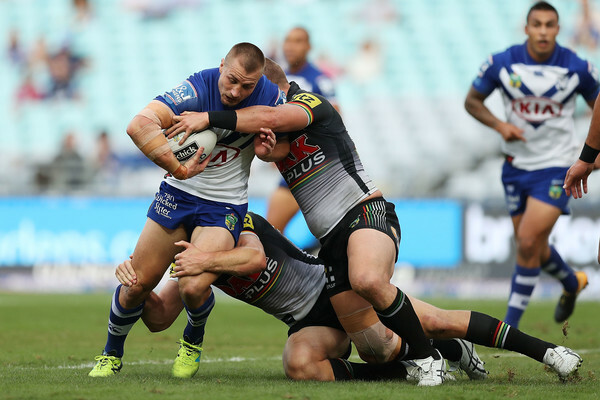 The Panthers clearly felt the same way, responding with an immediate statement in the form of a spine-tingling tackle on David Klemmer, and then proceeding to camp out on the Canterbury line, applying more and more pressure until Josh Morris broke the game wide open. Intercepting a cut-out pass from Nathan Cleary to Dylan Edwards right on the Bulldogs line, he ran the entire the field to ground the Steeden right under the posts, with only Blake and Christian Crichton getting close to him. It was to be the first of two epic tries from the Dogs, the second of which came a couple of minutes after, and was as powerful at short-range as Morris had been at long-range. Launching onto the footy as it grubbered and ricocheted off the ruck right on the Penrith line, Hopoate took the full burden of a crushing tackle from Edwards and Josh Mansour to simply place to Steeden on the chalk as calmly as if there hadn’t been a single Penrith jersey in sight, in a spectacle that was as surreal as it was strong, a testament to Hoppa’s superb calm, focus and vision under pressure. While Mbye might have hooked the ball away to the left on the next conversion, this magnificent pair of tries still made it feel as if the Dogs had really arrived, and went a long way towards cancelling out the question marks that had hung around their opening four points. At the same time, however, the Panthers seem to thrive on being the underdogs – they started both their victories in 2018 from a 14-0 deficit – and this was no exception, with the mountain men taking advantage of the pressure to put down four points that fused Morris’ and Hoppa’s respective efforts into a team try that showcased the visitors at both their long-range and short-range best. It started with a quick pass from James Tamou to James Maloney, with Jimmy then sending a cut-out pass to Isaah Yeo, who dummied left, put in a massive right hand fend on Hopoate and slammed down the field, eventually sending the ball back inside to Maloney, who’d glimpsed the play from the very beginning and never given up on it, however improbable it might have seemed at its inception. From there, he ricocheted off Morris and then outran James Graham to put down four points that showcased the Panthers’ long-range vision and short-range strength – a brilliant team try from a team that tend to be particularly good at orchestrating team tries. The Dogs didn’t take long to respond, however, with Mbye putting in the kick return of the game a couple of sets later to elude Crichton and Whare, get on the outside of Corey Harawira-Naera to get the ball across to Morris, who burned up the sideline and momentarily looked as if he might just break through the line to put down his second four-pointer in twenty minutes. While the Panthers – just – managed to contain him, the Dogs looked dangerous on every tackle, continually on the verge of breaking through the line and never losing the momentum of Mbye’s kick return. With that kind of relentless rhythm something had to give, and sure enough the Panthers were caught offside, conceding a penalty, and giving Mbye the opportunity to add a fairly easy two points to their lead. In the decision that probably won them the game, however, the Dogs chose to tap and go – a choice that paid immediate dividends, as Mbye broke through a tackle from Mansour and Maloney, and then ducked under a massive follow-up effort from Yeo, to get the Steeden to ground. It was a classy move from Mbye, and the culmination of a classy opening half – all in all, probably the forty minutes when he’s done most to showcase his newfound confidence at fullback in 2018, as he combined the hard run of Morris with the split-second putdown of Hopoate into an act of consummate and confident leadership. The fact that he managed to get through the conversion this time – from a considerably more challenging angle than the first two – just made the Dogs’ decision to tap and go feel all the more triumphant, as they soared to a more secure lead and started to glimpse the possibility of their first win of the 2018 NRL season. Over the course of this opening stanza, however, both teams had gradually telescoped and accelerated their playmaking options, and the Panthers were the next to take advantage of that mutual momentum, thanks to a brilliant short ball from Maloney to Viliame Kikau about fifteen minutes out from the line. Thinking quick, Edwards circled around and got ready to pick up the footy from his forward almost before Maloney had completed the pass, allowing him to collect the Steeden and storm down the wing before the Dogs had a chance to recompose their defence. It was a staggering spectacle to behold in slow motion, as Edwards outran one, two and then three Canterbury-Bankstown defenders, before putting down the last of what had felt like a succession of clutch tries over these first forty minutes. So tense and precarious had the atmosphere grown that the scoreline had started to feel incidental, with the advantage instead lying with whatever team last managed to score, meaning that the Panthers headed into the sheds with their heads held high. Sure, the Dogs might have been technically ahead, but given the way the second half of this opening act had unfolded it was hard not to feel that the mountain men somehow had the advantage too, especially given their pattern of returning from behind in the second stanza in 2018 so far. That pattern was disrupted, however, by the distressing news that Cleary had sustained a medial ligmant injury midway through the first half, and that he would be sidelined – not merely for the match, but for the forseeable future – an announcement that understandably sobered the Penrith players, who jogged back onto the field with a noticeable slump in morale. That was just one explanation for why the acceleration of points stopped so abruptly, with only the Panthers scoring a solitary try in the dying moments of the game to bring them to within two points of the Bulldogs. 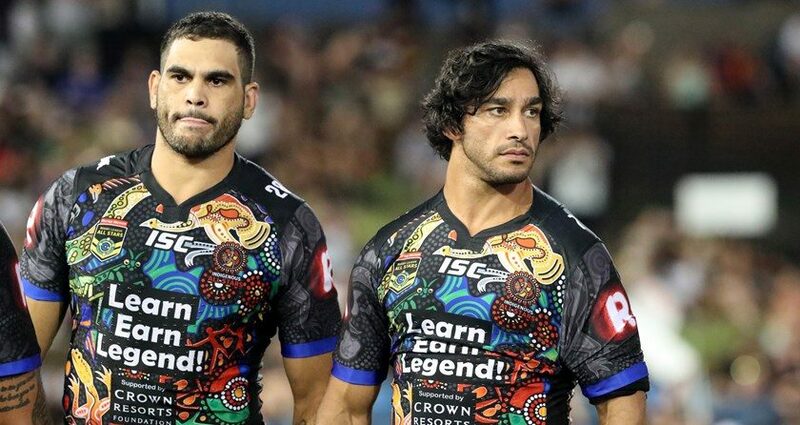 At first, it seemed as if Fa’amanu Brown had put down a try early in the half, after he scooped up the ball from Aiden Tolman and burrowed through the Penrith defensive line right on the line, getting the footy to ground before the Panthers had even seen him coming. Unfortunately, the speed of the play was also its undoing, with Brown smashing Tolman in the Edwards in the effort of breaking through the Penrith pack defence, sending out a ripple effect that caused Tolman to obstruct Edwards in turn. It was an unusual situation – a tryscorer causing his own obstruction – but in some ways it was probably best for the Dogs that the call went Penrith’s way, since it cleaned the slate with their own lucky obstruction decision at the beginning of the opening half, and made everything they’d achieved feel even more legitimate and deserved in turn. Over the next thirty or so minutes, the ball moved up and down the ground, with both teams struggling to crash over, but neither quite able to put down the try that would determine the next episode in the game. After ten minutes out, the Panthers looked as if they had a fair chance after Mbye faced some genuine pressure under the high ball for the first time of the evening, only for Mansour to concede a try as soon as the Dogs collected the Steeden and started their match back down the field. Gaining their own penalty a couple of minutes later, however, the Panthers regathered and regrouped, with Blake running the ball and making it over the line only to be held up by a scrambling Bulldogs defence. Like the spectacular Canterbury set that had started with Mbye’s kick return and pass to Morris, however, Penrith had built up enough momentum here to withstand Blake’s containment, and seconds after they executed the single best sweeping motion of the night, using up every centimetre of the field as the footy sailed across to Mansour on the left wing. It may have been the only try of the second half, but Mansour ensured that it rivalled any putdown in the first stanza, flinging his body over the sideline and wrapping his arm around the corner post to get the Steeden to turf with only his hand, and the footy, still in the field of play. Only the Dogs’ stunning defence over the final minutes could rival that for spectacle, and while they may have won their win was all the more impressive for the punishing and powerful combat brought to the park by both sides, in one of the most exciting, evenly-paced games of 2018 so far.